A huge, distantly orbiting alien planet has caused researchers to rethink planet formation. A planet 11 times more massive than our Jupiter orbits its star in the most distant orbit seen yet, researchers have discovered. Named HD 106906 b, it is larger than every other planet in its solar system and circles its star 650 times the distance between the Earth and the sun. A thermal infrared light image shows just how far HD 106906 b is from its star. In the bottom left is the solar system's star, and in the top right is the planet. 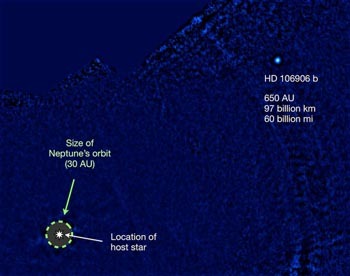 Pictured for comparison is the size of Neptune's orbit around our sun, making Neptune's orbit of 30 AU (astronomical unit in which 1 unit equals the distance from the Earth to the sun) seem tiny next to HD 106906 b's 650 AU (60 billion miles). "This system is especially fascinating because no model of either planet or star formation fully explains what we see," Vanessa Bailey, the study's lead researcher, said in a statement. The most accepted theory of planet formation states planets rotating near the parent star began as small bodies similar to asteroids. They clump together in the gas and dust around the star. This is an extremely slow process and one that does not explain the formation of planets like HD 106906 b, Bailey said. Distant giant planets may form similar to a mini binary star system, which forms out of two adjacent and collapsing clumps of gas to form stars. "These stars are close enough to each other to exert a mutual gravitation attraction and bind them together in orbit," Bailey explained. In the case of HD 106906 b, the planet may not have had enough materials to grow large enough to a star. Still, researchers have observed a difference in mass ratio of stars in a binary system typically no more than 10 to 1, and in this case the mass ratio is more than 100 to 1. HD 106906 b raises a lot of questions, but there's hope for answers. Because researchers have information about the system's environment, Bailey says observations of this planet's orbital motion may answer questions about formation.